The TAM-1 has a fluxgate sensor unit that is separate from the electronics unit. The sensor can be located outside the satellite platform on a boom where it is less influenced by magnetic sources within the spacecraft. The sensor can operate over the much wider temperature range (-90ºC to +80ºC) required of instruments in this severe environment. 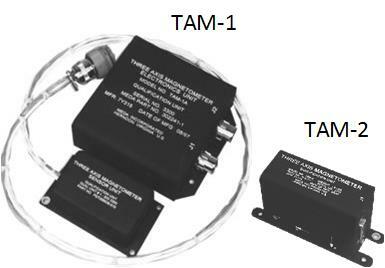 Download the Data Sheet for a complete description of the TAM-1. The TAM-2 integrates the fluxgate sensor and the electronics into one package. It is a compact low power magnetometer that is suitable for use where an external sensor is not needed. Download the Data Sheet for a complete description of the TAM-2. The customer can specify additional tests if the environmental requirements are more severe than the current magnetometer qualification levels. Each delivered satellite magnetometer is accompanied by an End-Item-Data Package that includes its manufacturing history, acceptance test results, all required certifications and as-built documentation. In addition to the satellite magnetometers used for attitude control MEDA also designs and manufactures Hi Rel space qualified magnetometers for scientific applications. Contact MEDA for details and pricing.